Baked squash is one of my favorite fall and winter foods. I loved them even as a child as I wasn't a picky eater at all. I watched in anticipation as my mother would prepare acorn squash for baking, and then when they were almost done, she'd add brown sugar, bacon, and butter to the cavity wherer the seeds had been. You don't need a recipe for this dish, just a large sharp knife and a steady hand. 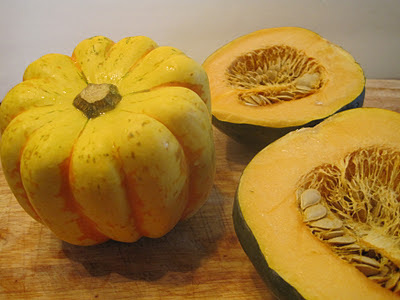 I also found a Carnival squash to bake along side the acorn. It's bright and colorful, but still tastes like the acorn squash. You can use brown sugar or maple syrup in these beauties, and use as much, or as little butter that you want. The butter and sugar combo does soak into the squash as it sits, so it's best to serve them fairly soon after they come out of the oven. If you can, cut of the stem from the squash. 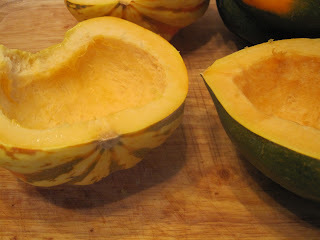 Then holding onto the squash, cut through it from the stem to the pointed end. Take a spoon and scape out all the seeds and as much of the stringy fibers that you can. Now you have cups to hold that wonderful filling! Spray a baking sheet with cooking spray and lay the squash cut side down on the pan. They need to cook upside down so the interior will stay tender. After they are done, turn over and fill with as much brown sugar, or maple syrup, and butter as you want. Add bacon then too, or wait until ready to eat. It's your call when to add the cooked bacon. You will need 1 squash for every 2 people. Try to buy squash that are similar in size for baking. Baking time will vary, depending on the size of the squash. 1. Cook bacon in a skillet. 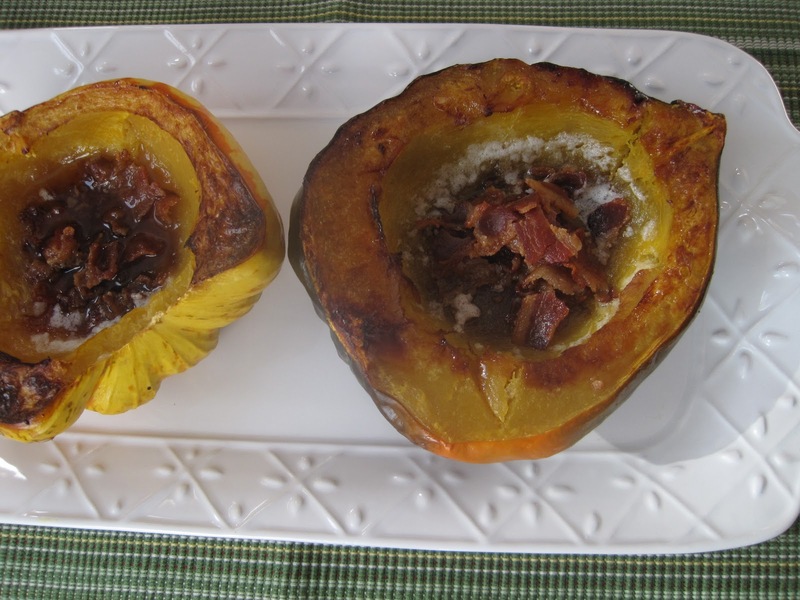 You will need 1 slice of bacon for each squash half. Crumble when it's cool. Set aside. Preheat oven to 375 degrees. 2. Wash the squah; dry. With a large knife, cut the squash in half from the stem end to the pointed end. Using a spoon scoop out all the seeds and the stringy fibers and discard. 3. Spray a baking sheet with cooking spray. Lay squash cut side down on pan and place in the oven. 4. Bake until the squash feels close to done when touched. Depending on the size, it can take from 30-45 mintues to be almost tender. With a spatula, turn the squash halves over. Add butter and brown sugar to each squash. I used about 1 tablespoon brown sugar to each, and added about 2 teasppons butter also. You may use more, and I'm sure I have used more than this before, because I don't measure. I just eyeball it. More is better in this case! You can also use maple syrup instead of brown sugar. Place the squash back into the oven and bake about 15 minutes more until the squash is tender. Remove from oven and add crumbled bacon to each squash. I have to admit, I eat the squash with a spoon sometimes, ( most of the time ). I scrape all the squash together and mix it with the fillings. With a spoon I can get every last tidbit of deliciousness! NOTE: You can test for tenderness by poking the flesh of the squash with a fork. If it is soft, it is done. Just don't poke through the shell, or the filling will run out. oh yum -- this looks delish. One of my favorite seasonal meals was Acorn squash, cinnamon pan apples and sausage... my mom would cook the breakfast sausage in the cavity of the squash..
and there was always plenty of brown sugar and butter on the table. I've tried to become a fan of winter squash but so far I've only really liked it in dishes with many other items. However, with bacon, butter and brown sugar I could see me getting there. I am on the fence with squash - but husband loves it - so I am always looking for new ways to present it. Of course you added bacon - so now I'm thinking.... this is pretty good! Happy Thanksgiving! I've always wanted to try baked squash! 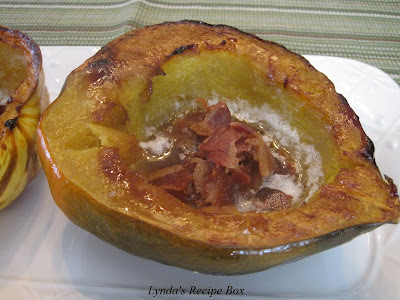 i've never slipped bacon into my baked squash, but it's clearly a terrific idea! happy thanksgiving, lynda! Bacon makes every dish happy, I think it should be one of the 5 food groups. :) So happy to meet another church cook; a rare breeds we are. Let's keep in touch, Lynda! I don't think we can buy acorn squash here in Australia. That is a lovely looking dinner - simple to do and something everyone in the family would enjoy. Never occurred to me to add bacon, Lynda. What a super idea! This looks delish!